A lot of R2D2 or USB cufflink flash drives are available on the market, but this is the first R2D2-designed flash drive and cufflink combo. The data storage device has been designed for Star Wars fanatics and has been licensed by the genius himself, George Lucas, the Star Wars creator. The R2D2 USB cufflinks come with a 2GB memory capacity per cuff, making sure that dad doesn’t run out of space to save his work or important files. And because they are finely made, functioning cufflinks, they add a personal touch to his snappy suit. The USB flash drive cufflinks measure around 3/4″ by 5/8″ and really stand out on a spiffy dress shirt. If that’s not enough, you may also opt to give it a more personalized feel by having the man’s initials engraved on the back. This would be icing on the cake for an additional $8. But as they say, beauty comes at a price. 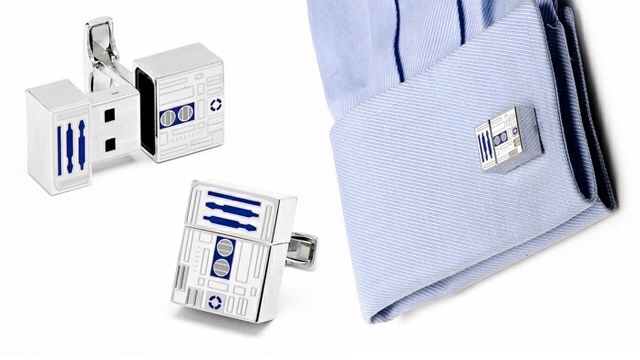 The same is true for the R2D2 USB cufflinks which are priced at $200 a pair. This might be a bit pricey but the silver plated enamel exterior plus the intricately detailed design makes up for it. You might also want to consider the fact that they are officially licensed by Lucas Films. Now we’re left with two questions: Is the Force with these USB cufflinks? Will C3PO ever get his share of the limelight? Don’t forget to share your thoughts here. This entry was posted in Articles, USB Cufflinks, USB Flash Drives, USB Gadgets and tagged Fathers Day Gift, R2-D2 Cufflinks, R2-D2 USB Flash Drive Cufflinks, R2D2 Cufflinks USB, USB Cufflink, USB cufflink flash drives, USB Cufflinks from Lucas Films. Bookmark the permalink.